Freshly discharged Monty Brewster comes home to marry his girl Peggy and almost immediately is found by the executor of a recently deceased uncle’s will. 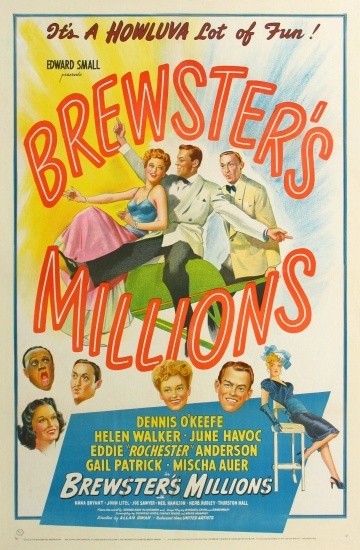 Publicly, Monty is told that he’s inherited one million dollars, but privately, the executor informs him that the uncle’s fortune was eight million, and the rest will be his if he can squander the first million by his thirtieth birthday, two months away, a provision intended as an ordeal to make the beneficiary swear off spending forever. Monty immediately founds Brewster and Company, hiring all his friends as vice presidents, housing the company in the most lavish office he can rent, and throwing money at any venture, the more doomed the better. Unfortunately, as the will forbids him from telling anyone about the other seven million and the requirements to get it, Peggy doesn’t see those women he’s spending all that time with as ways to blow thousands but suitors he’s more interested in now that he has money, and all his friends only see a mad spendthrift and do their best to save the company and their friend from bankruptcy. But if Monty has so much as a dime to his name at the deadline, he not only loses the seven million, but has to return the first. This is more directly based on the play based on the book, and certainly has a stage quality to it, without many sets to house the action. However, there are more moves than I’m used to for a play, so I couldn’t say how related it is. It’s very dialogue heavy, but then so was pretty much everything in the 1940s and it’s a very talky idea. The stipulations of the will alone make a rather long dialogue scene. For such a dialogue-driven film, O’Keefe gives a highly physical performance. Whenever possible he’s bouncing around from one money pit to the next, as fast and frantic as the urgency of the scene allows. A lot of the humor comes from his physical delivery of Monty’s quips, but I noticed Eddie Anderson’s character had the most obvious one-liners. “Jackson” felt like he had a different relationship with the rest of the characters, but his jokes felt straight out of Rochester’s mouth. Probably a decent compromise. Apparently, the original novel had two different inheritances. One relative left Brewster one million, and another relative who didn’t like the first stipulated that he could only have the larger fortune if he got rid of the first bequest.I think that’s both funnier and more likely, but I think the story improves by being simplified into one award. The secrecy clause certainly makes more sense this way, with everyone’s reactions to his spendthrift actions further making the money dump an unpleasant process. This is a fun concept, entertainingly set out here, but a pretty small movie. It’s light, quick, and fast-paced, and doesn’t ask too much of the viewer. Perhaps that’s why it’s been remade so many times. One million is considerably less today than it was then, but numbers are easy to change, and have been. Each version brings it to new audiences and revives the simple concept for a new day, an ageless romp in new clothes. Sounds a little bit like the plot of Seven Chances.